eh....turn 3 this, turn 4 Blessing of Kings? actually not even that bad. Certain classes in Arena would certainly like a stealthed 3-drop that curves into buffs. Good in arena, pack filler. One of the few truly offensive filler cards of the set. Jungle Panther has better stats for a stealth minion AND has a useful tag. Does not see play. Aggressive 2-health minions die to Holy Smite. This is better but still won't see play because there is no synergy. I dunno, I kinda like it. 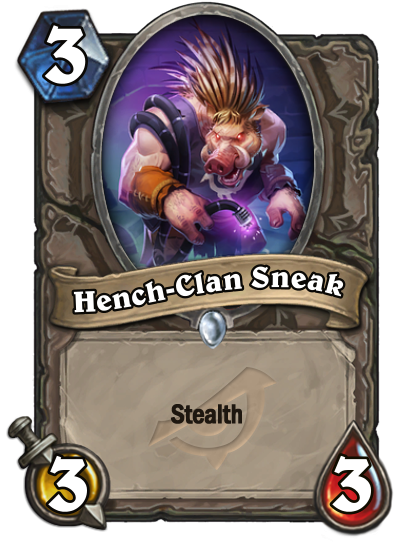 Worst Hench-Clan card by far, and I'll probably never use it, but Stealth has its place in the game. arena not a good one either. It's decent i guess, if you have a way to take advantage of the stealth.